Click > Tests to go to the Tests page. Click Create test at the top of the page. 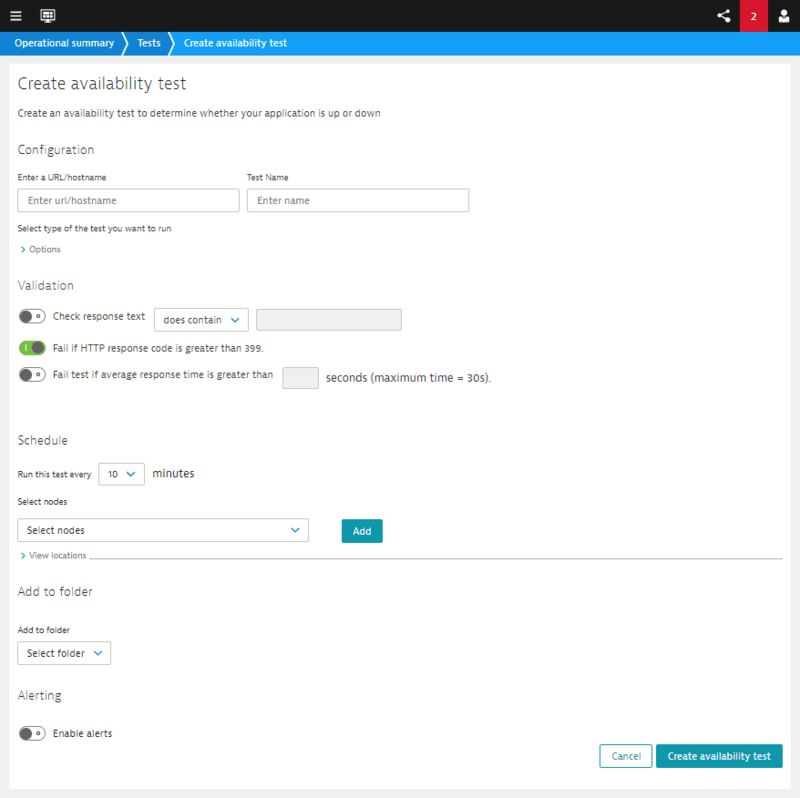 To create a new test based on the settings for an existing test, expand the existing test and click Clone test. Use the test configuration page to define the test, as described below. If necessary, use the search field or filters to find the test. You can also expand the test, then click Edit test to display the test settings. Edit the settings as needed, then click Save test. Define the test&apos;s basic details. URL/hostname – Provide the URL of the page you are testing. Test name – Provide a test name to identify the target or purpose of the test. As a best practice, include the test type (Http, Dig, Ping, Trace route) in the name. Click Options to display these optional settings. Define – Define HTTP requests for the test. Select method – Select Get or Post. Body – For Post, type the body content in the field. If you selected GET, this field is unavailable. Authentication – If the target page requires login with basic authentication, enter the Username and Password. 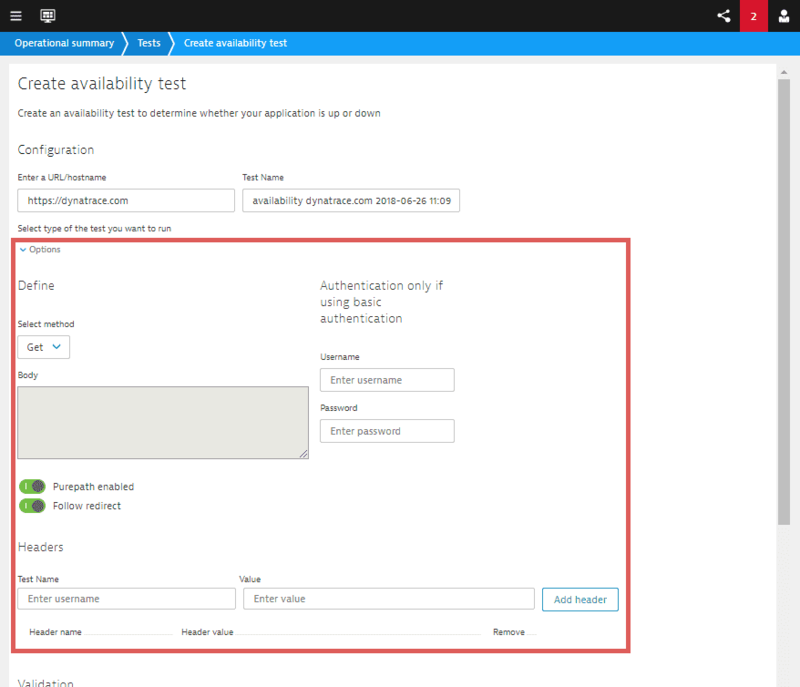 Purepath enabled – When this setting is selected , Availability tests generate PurePaths that can be investigated in more detail through the AppMon interface. The PurePath ID is displayed in the response headers section of the Http summary page. Follow redirect – If the target web page is coded to redirect to another page, follow the redirect in the test. Headers – To specify header information such as cookies, cache control, GZIP encoding control, or connection keep alive rules, enter a Test Name and Value for the header, then click Add header. Check response text – Select whether the response does contain or does not contain the validation text, and type the validation text in the field. The test will fail if this condition is not met. Fail if HTTP response code is greater than 399 – Any response code 400 or greater indicates an error. This setting is enabled by default. Fail test if average response time is greater than – Enter the number of seconds for the response time threshold. Run this test every – Select from the range of minutes, from every 1 minute through every 60 minutes. Select nodes – Click the field to display the list of Backbone nodes that are available to your account. Select the check box next to each node. When you&apos;ve made your selections, click Add. To review the selected nodes, click View locations. You can remove a node from the test by clicking the X at the end of the node name. To add an Availability test to an existing folder, select the folder from the Add to folder list. Note that the same folder can contain both Availability and Performance (Browser Agent) tests. To create a new folder for the test, go to the Folder management page. Click the Enable alerts switch to display the alert settings. Number of nodes that trigger alert – Specify the number of nodes where the test must fail to trigger an alert. Number of consecutive errors that trigger alert – Select the number from the list. Reminder frequency (in minutes) – The default is Never. To send reminders until the condition that caused the alert is resolved, select the frequence; for example, to send a reminder once every hour, select 60 (minutes). Level – Select whether to trigger the alert if the test is Failed or Improved. Destination – Select the alert destination from the list. These are the same alert destinations defined for Performance tests. 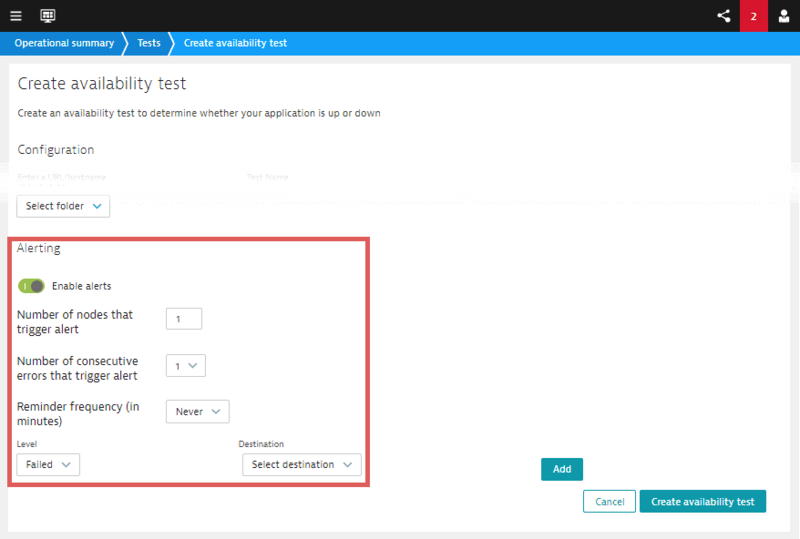 You can&apos;t create a new destination within Availability test settings. If you need a new destination, use the Alert Destinations tab in the Alerts page.